The road network of Styria (Austria) is available in official shapefiles. User Spice determines which roads are still missing in OSM and Thomas Konrad created a shapefile with these missing roads. User SK53 blogs about ideas of how to map trees. Inspired by the German “weekly task” (which in reality is a fortnightly task = week 51/52) “KW 51/52 public transport / timetable change” mappers in Belgium want to improve their data. User Skippern asks how tracks are mapped, if their use varies during the week or even on a daily basis. From version 2.26.0 of the OpenStreetMap-Carto style sheet onwards (this is the default style in osm.org), amenity=place of worship and aeroway=terminal without building tags are not rendered. However, this was changed back to version 2.26.1 for place_of_worship, so these also now appear back on the map, without the building date. User malenki, who is familiar with Scout/skobbler, draws a conclusion about Scout Signs and shows how it could be improved. Rob Nickerson talks about two proposed amendments and asks how the OSM Communnity handles it. A discussion about the maturity of OSM started on the talk-mailinglist. User SteveC in a IAmA on reddit. Note: You can initiate a survey in this way without asking. The Mapper of the month in Belgium: the Ueber-Mapper Guy Roman. Rainer Fügenstein informed us in an email of the talk mailing list- as it is good practice in OSM – that – after a vote on the proposal to pipelines – he wants to perform the necessary changes automatically. This led to (unexpected) reactions. User Abbe98 reports on a necessary “clean-up” to an import, so that he can continue working with iD. Four additional Tiles Servers were integrated into the OpenStreetMap CDN (Content Delivery Network). Thanks to Jump Networks, CARNet, OSUOSL and NCHC for doing this. The Disastermapper from Heidelberg looks back on 2014. Russell Deffner writes about his intentions for 2015. Sam Larsons looks back on HOT 2014, and his expectations for 2015. 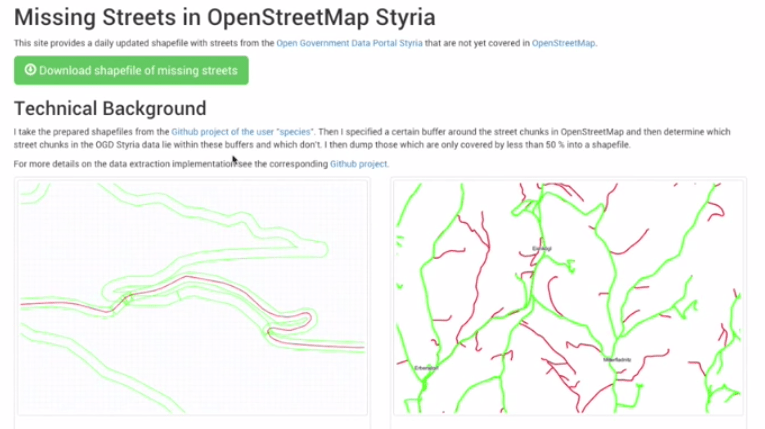 All changes have been made in the new OpenStreetMap-Carto Style (v2.26). The OSM map (here: L’Alpe d’Huez) in 3D. Cool. In the tutorial “From Paper Maps to the Web”, Mauricio Giraldo Arteaga shows how to georeference and use old maps. The airline JetBlue showing its passengers the route with OSM maps. Wikidata has problems with vandalism. The Swiss canton of Zurich adopted an open government data strategy. Update: “Live Layer Effects” for QGIS on Kickstarter: Video with some functions. The new version of OpenStreetBrowser and pgmappscss use the overpass api as database backend. Stephen Knox looks at the growth of the OSM database and wants to investigate the use of large parallel databases (eg. as Hadoop) in his “GIS MSc thesis” at Kingston University (London). Author Thomas Newton and Oscar Villarreal have published the book “Learning D3.js Mapping”. OSM should more work like HERE: changes to the data should be printed, stapled to the wall and checked if they are OK. (please see the second photo below ;-)). Test your geographical knowledge every week with GeoQuizz from Geoawesomeness. Paper Street View by Google is a paper map from Google Maps and a pointer (please start video), which can be moved on the map. This Street View is displayed on a screen according to the movements.